Product display and product capacity are fully flexible with two adjustable tray configurations, two temperature zones as well as the ability to operate two spirals simultaneously. This allows for the dispense of larger sized foods. Flexible & reliable & robust the azkoyen palma h series is easy to maintain and boasts a score of a+ in energy efficiency. The large shop window presentation acts as an attractive product display. 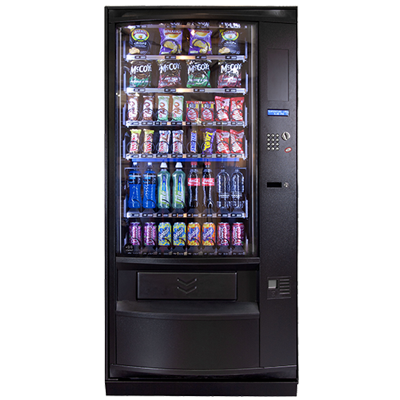 The palma h series is designed to vend products of any size. The adjustable shelves allows you to modify the channel width and adapt the presentation style, allowing you to adjust your range of snacks and cold drinks to market trends without limiting choice. The innovative idetect technology provides 100% vandal-proof machinery. Made from galvanized steel, the palma h series provides an anti-leverage system, steel buttons and triple toughened glass front. In addition, the collection tray is specifically designed to make accessing the product zone unachievable. Re-stocking and maintenance is easy and fast with features such as fully removable trays and doors that open at 90º. While fast and easy programming and set-up means you can enjoy your snack and drinks solution easily and hassle free. The Palma uses materials that are fully compatible with RoHS European directive, aiding recycling, while thermal insulation and the use of LED lighting, make the Palma series energy-saving, benefiting the planet, and your pocket.